Install OpenIV -> open with administrator rights -> Go to "tools" -> Click on "ASI manager" -> Install OpenIV.asi. 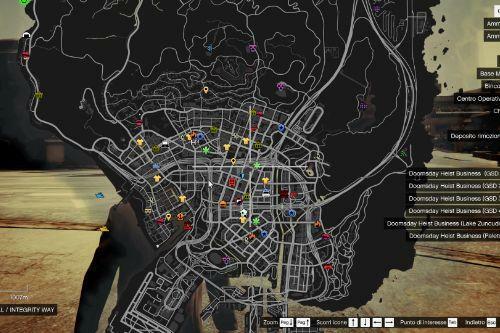 This will allow you to use the mods folder and thus prevent GTA5 from having conflicts with modded rpf archives. Have fun! 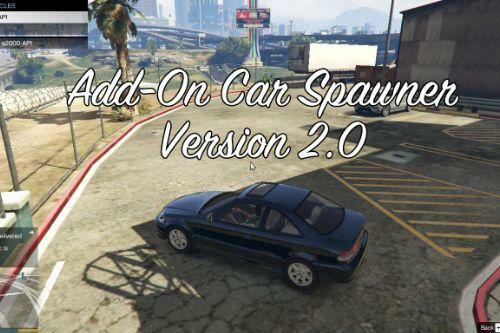 NOTICE: This mod does not work on all modded vehicles, because some of them use their own dirt maps. 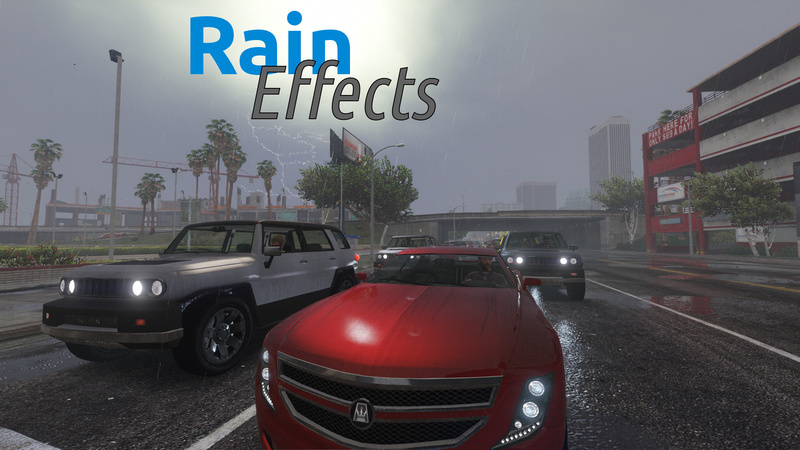 You can still make this mod work on those vehicles by finding the vehicles dirt texture (usually in the vehicles ytd file) and replacing it with the raindrop texture found in the vehshare.ytd provided with this download. To make use of the menu, you need NativeUI (https://github.com/Guad/NativeUI/releases/download/1.7/NativeUI.zip) installed into the scripts folder! 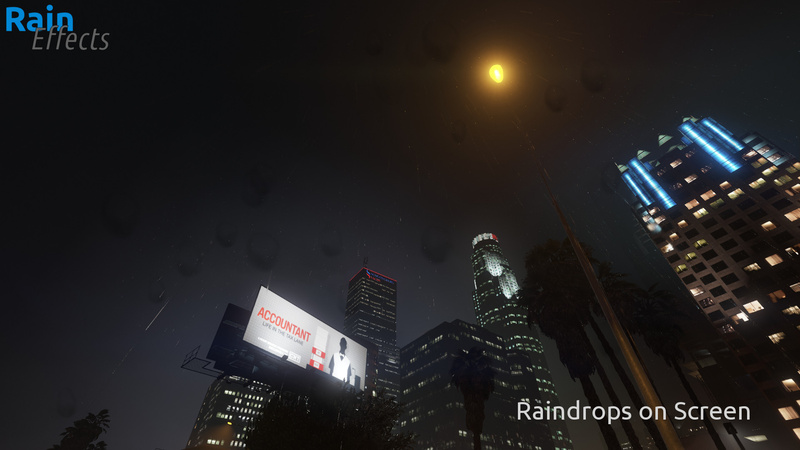 Many of you already know Per_zeus' raindrop texture mod (https://gta5-mods.com/vehicles/raindrop-texture-beta). But to enjoy the texture you had to manually set your car dirty (i.e. by trainer). 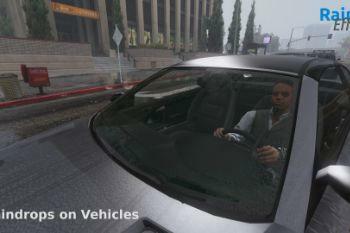 Also your car became wet when you drove over dirt, which did not look really realistic. 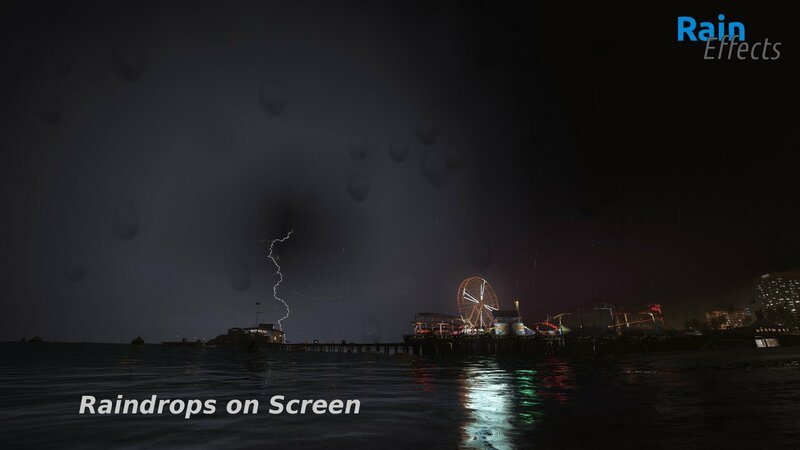 Once it is raining all cars will slowly become wet, and when the rain is over, the raindrops on the cars will slowly disappear/dry again... You can also enable the Raindrops on Screen effect though the settings menu (F5) which makes the raindrops fall on your gameplay camera! Love the idea of this mod! But, I appear to have a problem. 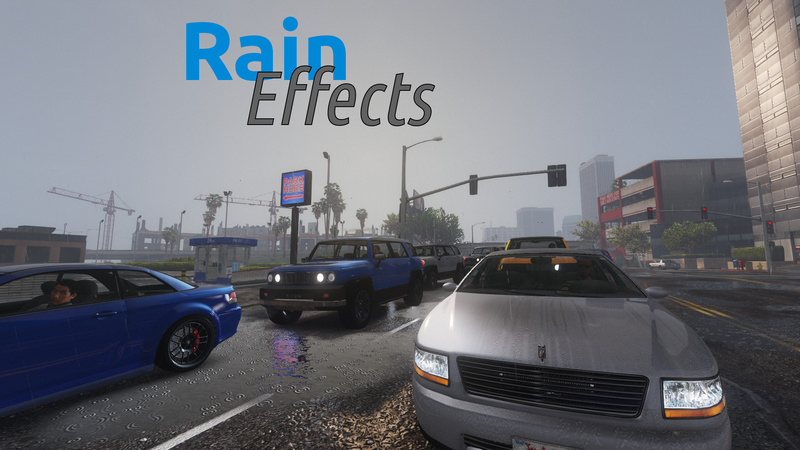 This mod won't replace the dirt textures, and it looks odd as hell seeing dirt appear the moment it starts raining. I've tried reinstalling the mod, and even manually replacing the dirt textures with the 4k dirt textures by kairu. Not sure what I'm doing wrong, but I'd really appreciate some assistance! Thanks in advance. @uPrizZ Sorry bout that! 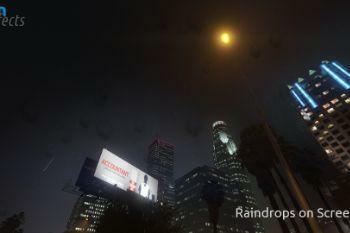 I'm still fairly new to modding GTA and using this site. I actually managed to fix it. I screwed up my game with another mod and had to start from scratch. Oddly, it worked this time. I still honestly don't know what went wrong before, but I don't care anymore since it's all fine now and looks amazing! 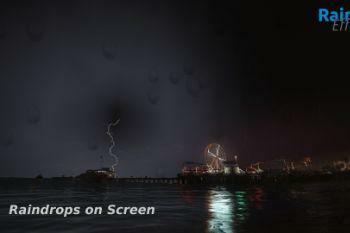 My favorite way to play is at night and with thunderstorms, so this just makes it 100x more beautiful! 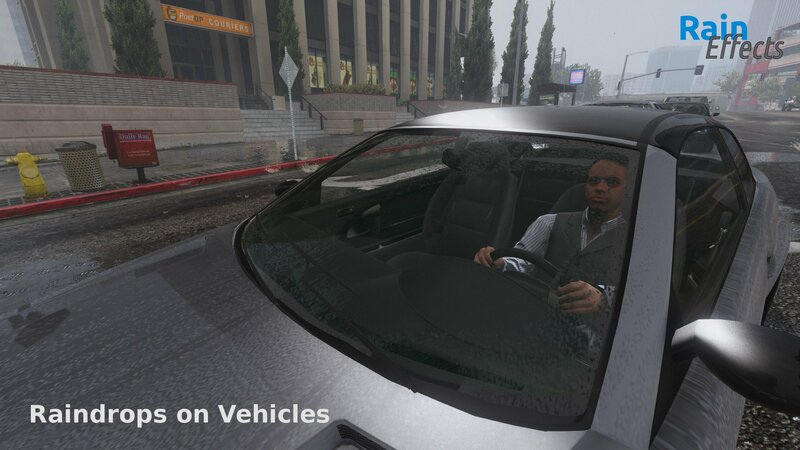 hehe the reason i dont download the mod is "Its replace the dirt" mean while u moving on desert or dirt sand dry terraint, the vehicles get wet from nowhere lol..
@uPrizZ I have the same problem as ToxicWarrior here uPriZ, the textures just aren't showing up! 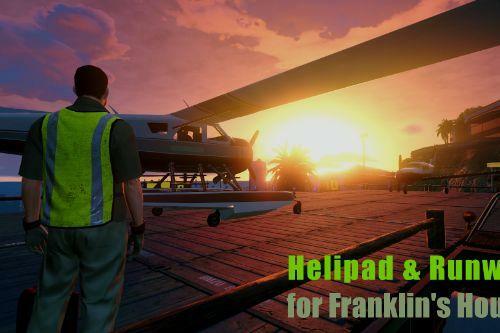 I am actually experienced with gta modding and have had this mod working in the past, but now it doesn't work. Rain makes cars muddy, god help i hate this! @ExoticParallel hard to tell what is causing this. Most likely this is caused by another modification. Try to install it on a vanilla version of the game. That should work and would mean that there is a mod conflict. In that case I cannot really help. If it doesn't work on a vanilla version though it could be due to a system issue, for instance something set to read-only instead of read/write. But that is very unlikely. @C1intbeastwood i thought so too but then i pressed F5 and i turned it off. 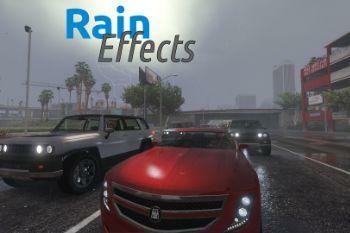 the rain looks great on the cars and the road. good luck with your video! 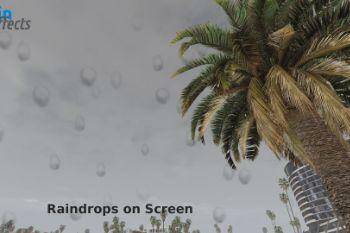 @Aquamarina then you did not install the script properly... make sure you have everything working. 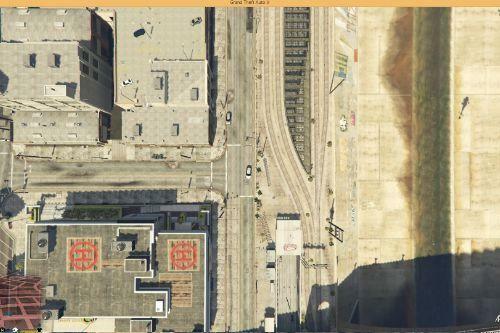 @uPrizZ Hey, can you try to draw the texture with "add decal" function and burnt map 1 choosen? This could be the solution for not needing to replace the dirt effect. @uPrizZ have fps shuttering when enabling this mod, any ideas? @EaGLe09x that seems strange... I cannot reproduce the problem on my end though, I am sorry. 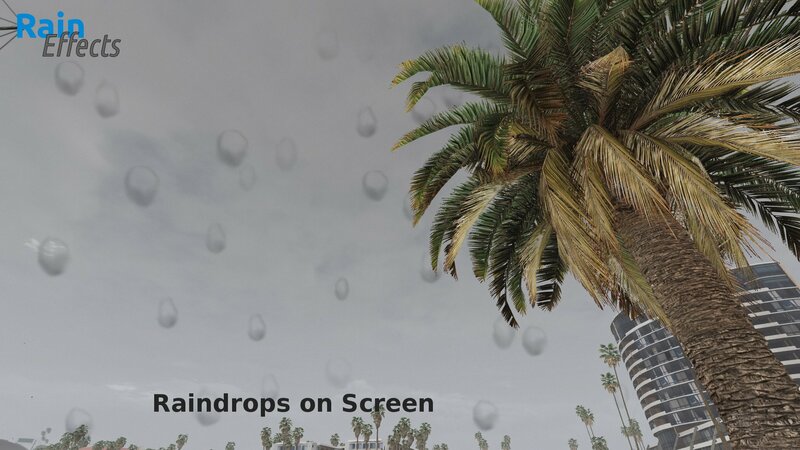 The rain on screen effect gets annoying, personally. Any way to disable? f5 doesn't pull up a config menu, help? Like the other effects though! 5 stars. @uPrizZ Dude, after i installed your mod, my game crash with some weird err_gen_zlib_2. How do I uninstall this? Because I had a well balanced x64e.rpf and now it's gone. Any solutions? download NativeUI for the menu to show up. But I have experienced that the config file and menu don't really work as intended anymore. I have planned to release an update soon anyway, where the screen effect will be disabled by default and also some other imporovements. Will it work with Razed's NVR? Does it replace visualsettings. Dat file?